Lavender International and STUK have partnered in the delivery of training to support NDT apprenticeship standards. 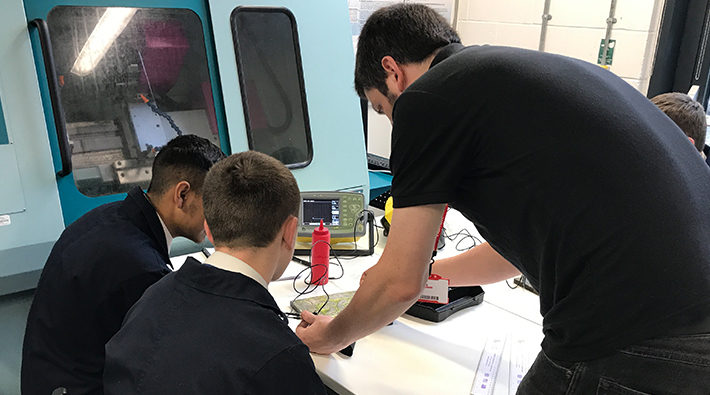 Lavender International NDT is backing the UK government’s Year of Engineering, as they continue to raise awareness of engineering, and specifically non-destructive testing (NDT), in young people by providing hands-on demonstrations to local schools and colleges. Lavender International specialises in NDT training, examination and consultancy services, and was originally founded in Sheffield in 1976. It now offers training and support programmes across the world from international locations such as the USA, Greece, South Africa, Canada and Abu Dhabi. A recently announced partnership with Skills Training UK (STUK) now allows Lavender to support the delivery of two of the non-destructive testing (NDT) apprenticeship standards, by delivering approved NDT training as a sub-contractor to STUK. Training could include Visual Testing, Penetrant Testing, Magnetic Testing, Weld Inspection, Ultrasonic Testing, Radiography Testing, Phased Array, and Time of Flight Diffraction. This exciting new partnership supports the government’s pledge to encourage young people to take a closer look at engineering as a career choice. The NDT Operator Apprenticeship and NDT Engineering Apprenticeship have been developed to ensure that apprentices are trained to the highest standards and become rounded technicians with the hope that they will fulfil the skills shortage gap within the industry. Tim Armitt, Managing Director, said: “As an NDT training company, our belief in the power of people and our commitment to securing the success of both our team and the people we train is at the heart of everything we do. Our recent partnership with STUK, which is the only organisation to twice achieve the ‘excellent’ score in the Merlin Standard Accreditation, means we’re able to work alongside an organisation, which aligns itself so naturally with our own core values of quality, flexibility and trust, and which is equally passionate about delivering the highest possible quality levels of training to all apprentices.